WATCHING the Clinton Political Machine begin to go to work on The Little Demagogue Who Could is a thing to behold. The little-handed bully with the funny hair may fold up like the cheap seat he’s always been. It was one thing to pull off an unlikely victory in the Republican primaries by using a mixture of Old Ideology (xenophobia, racism, sexism, and nationalism) and New Media (Right Wing Talk Radio, Reality TV, and the Alt-Right and Alright Internet and Twitterverse) to confuse and ultimately take down 17 self-destructive midgets, propped up by a Mainstream Media hungry for Red Meat and 24-hour ratings. But this is the Clintons, man. They were triangulating and DLC-ing their way into power when you were still a grasping Democrat-in-waiting. Over the past four decades, they’ve built a political machine that eats punters like you for breakfast in Des Moines. 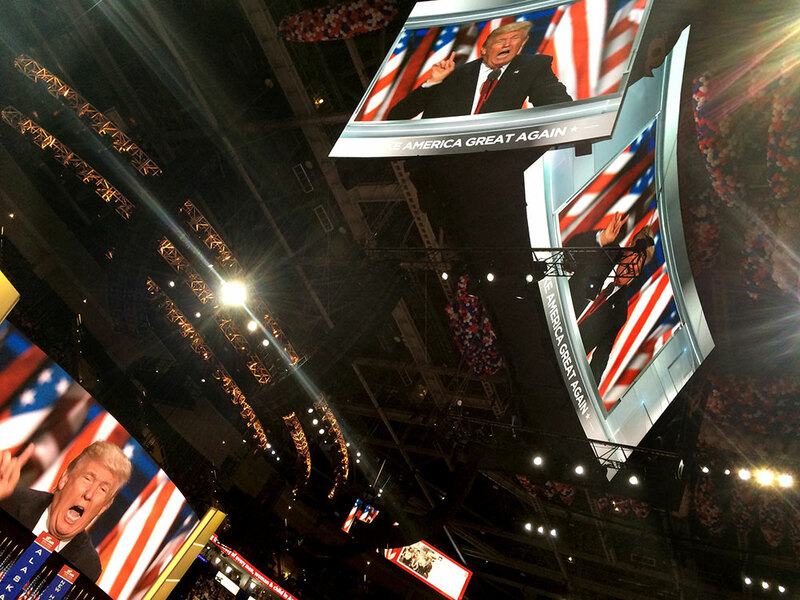 The convention was your first big test on this much larger stage, and you blew it. First, the security: turning downtown Cleveland into Guantanamo to contain and control a few perennial buskers with hand-lettered signs just looked desperate. I haven’t seen that level of over-compensation since George W. Bush locked down Madison Square Garden in 2004, and that was with a half a million of us marching outside. Then there was the line-up. When Republican and celebrity A-Listers snubbed you, you turned to the B, C, and D-lists, and then threw them all together in an order that made no sense whatsoever. On night two, the last five groups and individuals on stage were playing to an empty arena. It was amateur night in BelieveMeLand, and it reflected badly on your self-vaunted skills as a pageant maker. Your family did come through famously, but then you undercut them with your Bad Dad, il Duce impression of a speech, scaring the hell out of the nice people back home, and leaving your wife and children to sit on their hands flinching like abuse survivors. And you ceded the new grounds of patriotism, morality, and defense to the Dems in Philadelphia. And here’s a little tip for you, Scooter: You may have thought it was cute to treat the Press badly throughout the primaries and culminating at the convention, drawing on that reliable reservoir of contempt the Public has for the Mainstream Media. But the Media has only so much patience for this kind of opportunistic demonizing. Media has a memory. And now that Ailes has left the building, you’re going to need all the Press you can get. So I suggest you strap yourself in and strap one on, Little Donald. We’re heading into some serious turbulence.